Abundance: Has been recorded from several counties in the Piedmont; possibly more abundant in the right habitat. Habitats: Has been found in montane mixed hardwood forest habitat. Comment: This species is quite similar to some forms of E. affinis, which can also have a somewhat dark basal half of the wings. The main difference is in the dark basal half of the wings. 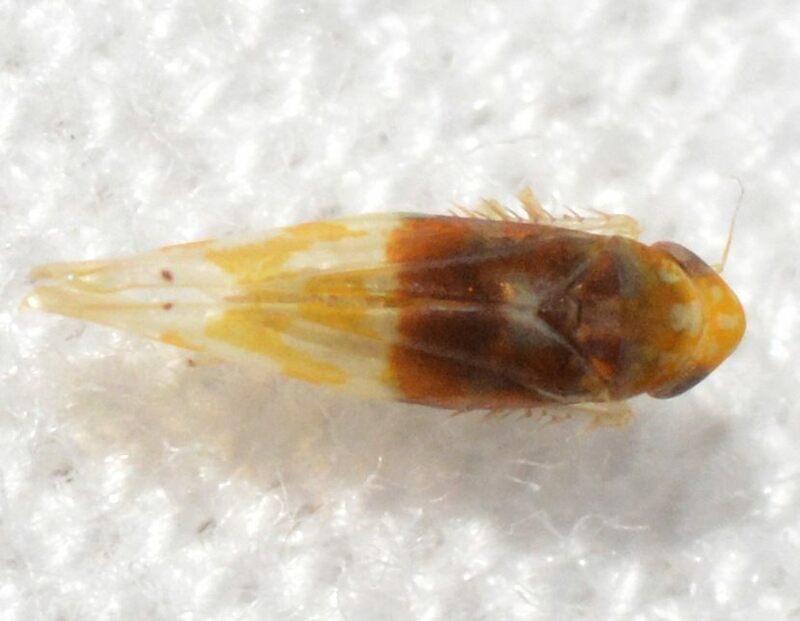 In basilaris, the dark patch is more or less uniform and a reddish-brown to dark brown color; sometimes there is a small pale, bluish-white spot near the tip of the scutellum that kind of fades into the surrounding dark patch. 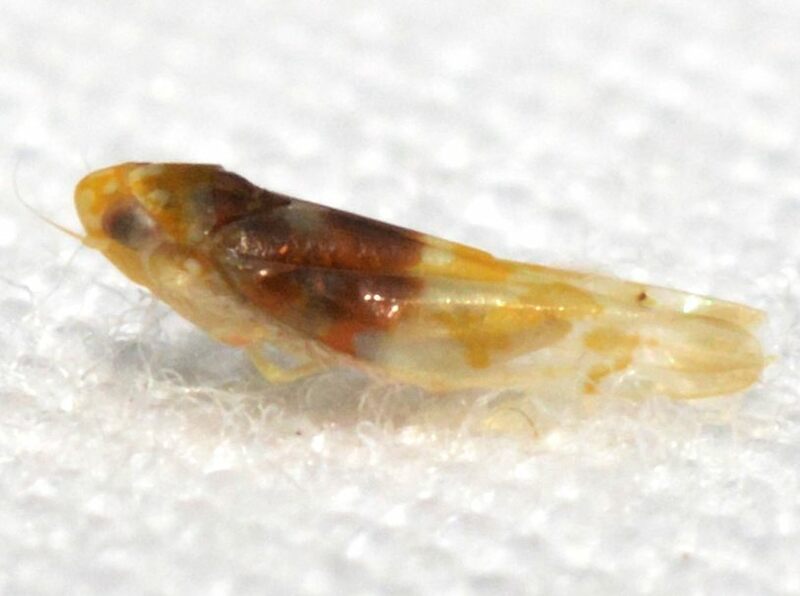 In affinis, the dark coloration is more of an orange to dark reddish-orange color, consisting of two usually noticeable 'arms' extending down from the sides of the scutellum and curving inwards towards each other near the middle of the wing. There is a prominent, square-shaped pale area that contrasts with the surrounding darker patches; there is also a pale patch radiating outwards on the side, below each 'arm'. Some individuals however fall in the middle of the range between these two species, with somewhat small pale patches and darker coloration. Below are the descriptions of color and pattern for the two species, from the Dmitriev 3I database, as well as links to the profile for both affinis and basilaris. Note how similar the descriptions are to one another. 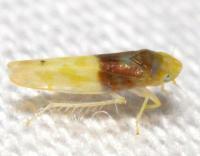 Links to the Bugguide pages that further demonstrate color and pattern pertaining to each species are provided. Individuals that fall in the middle range of coloration/pattern will be included under basilaris here until shown otherwise. basilaris- Dorsum yellow or white. Color pattern red or orange or brown. Vertex with orange parallel submedial lines (often with lateral branch). Vertex midline pale. Anteclypeus pale, concolorous with rest of face. Pronotum with Y- or V-shaped medial vitta. Mesonotum pale, with dark lateral triangles, apex dark, contrasting with adjacent pale areas. Thoracic venter entirely pale. 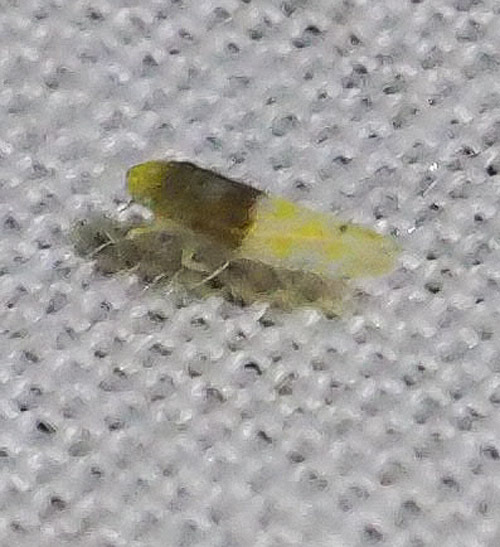 Forewings with broken oblique vittae, without crossbands or with crossband. Clavus with separate basal and distal vittae. 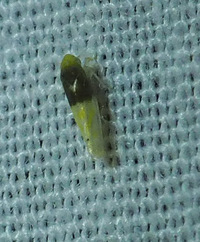 Forewings with dark spot on costal margin. Forewing apical cell II without distal spot, inner apical cell with brown spot basally. See here for more images of this species. 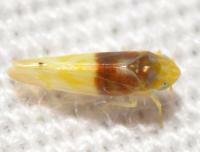 affinis- Dorsum yellow or white. Color pattern red or orange or brown. Vertex with orange parallel submedial lines (often with lateral branch). Vertex midline pale. Anteclypeus pale, concolorous with rest of face. Pronotum with Y- or V-shaped medial vitta. Mesonotum pale, with dark lateral triangles, apex concolorous with rest of mesonotum. Thoracic venter entirely pale. 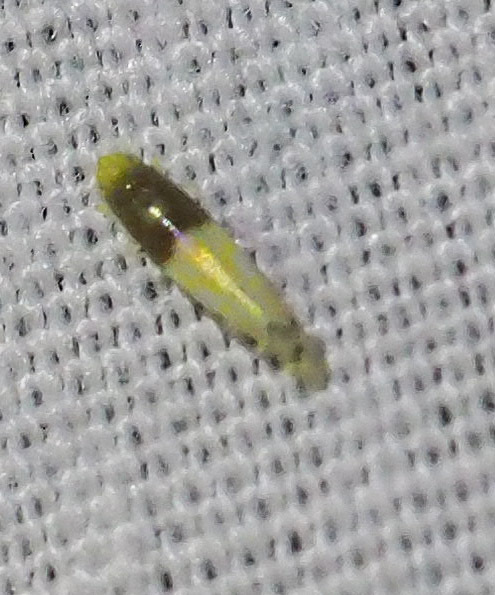 Forewings with broken oblique vittae, without crossbands or with crossband. Clavus with separate basal and distal vittae. 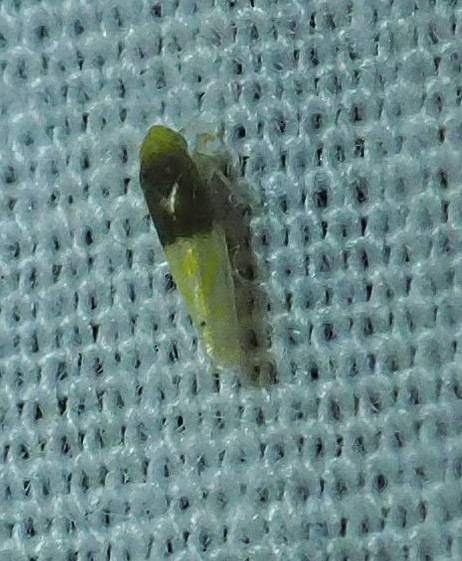 Forewings with dark spot on costal margin. Forewing apical cell II without distal spot, inner apical cell with brown spot basally. See here for more images of this species. NOTE: the forms of both E. basilaris and E. affinis that do not have the basal half of the wings dark cannot be identified to species level without dissecting a male specimen. These other forms resemble a majority of Eratoneura and cannot be identified past genus level.